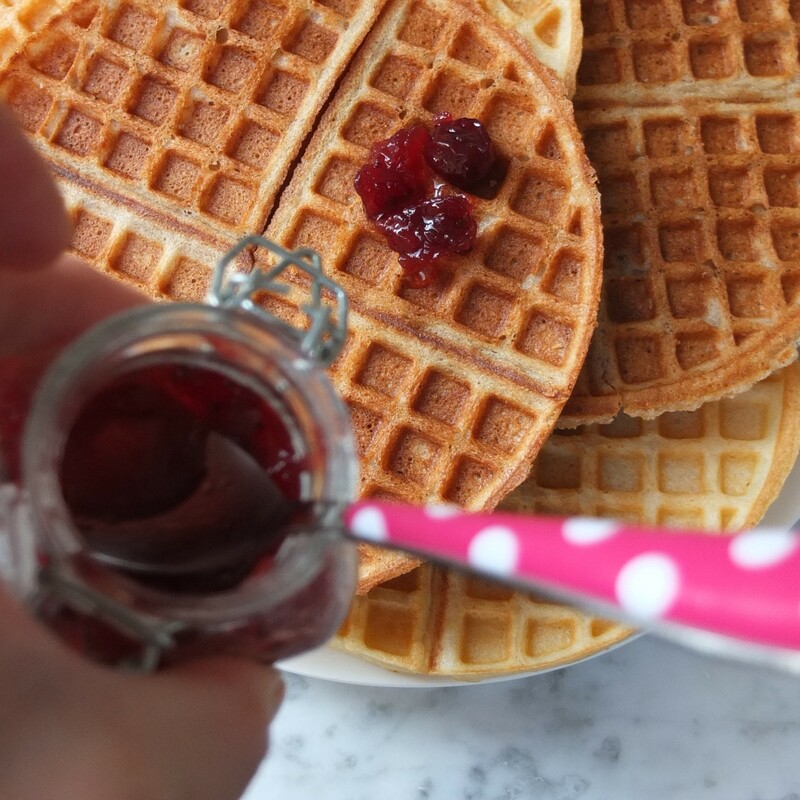 I’ve been laying low, hibernating briefly from the blogosphere but I’m popping out of my cave to share this waffle recipe with you because when I tasted them my eyes popped with delight like in cartoons while my little thought bubble said ‘OMG! Amazing!’. So here they are. I tried a savoury version but discovered they need sweetness from a little maple syrup or sweetened chestnut purée to complement the ‘beurre noisette’ – deliciously nutty browned butter. To make them lighter gluten-free flour replaces plain, there’s a reduced quantity of butter and instead of full-fat milk there’s dairy-free almond milk infused with vanilla or tonka bean. For fluffiness stiff peak egg whites are folded gently in. 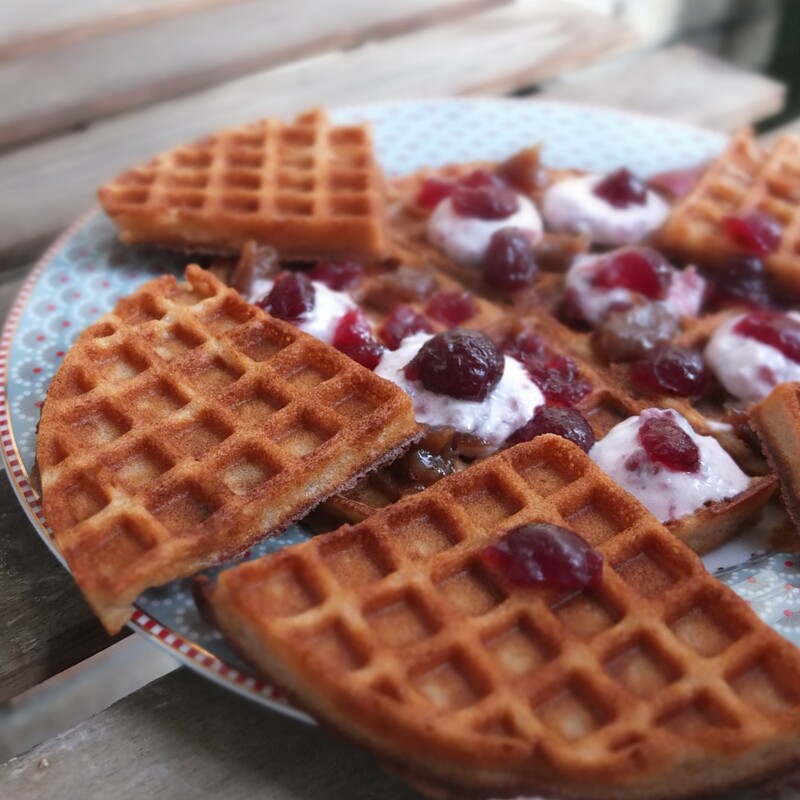 Adapted from a recipe by Cedric Grolet, top French pâtissier, these ‘gourmet’ waffles can be served with yummy toppings but they’re so good you can eat them alone – heavenly, delicious and an absolute delight! Especially the darker chestnut ones… yum. 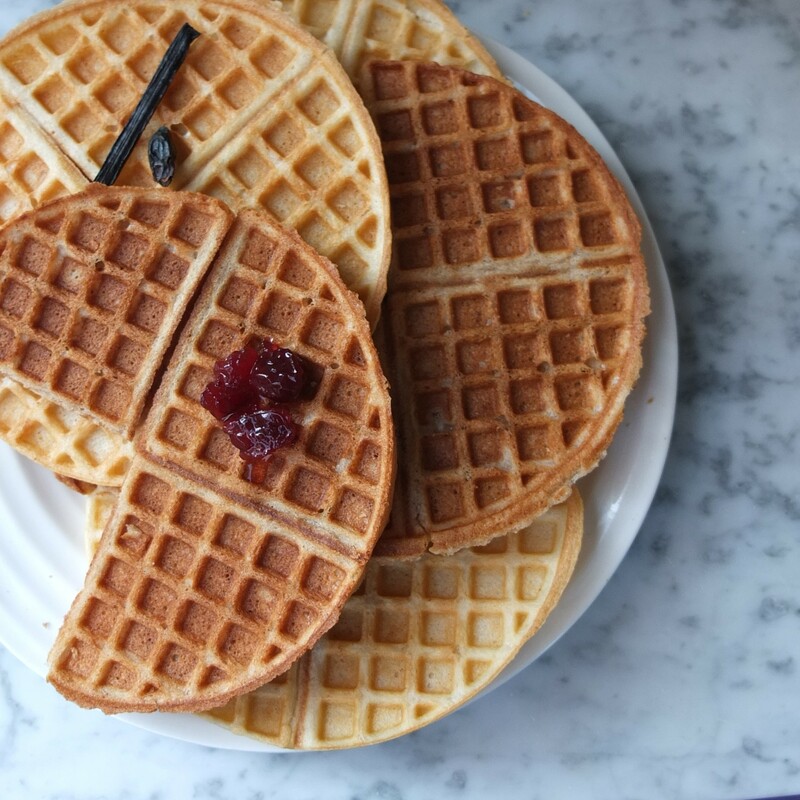 The recipes in Cedric Grolet’s FRUITS book of pâtisserie are pretty complex (and a bit scary to be honest) but I spotted these simple waffles. Hurray! 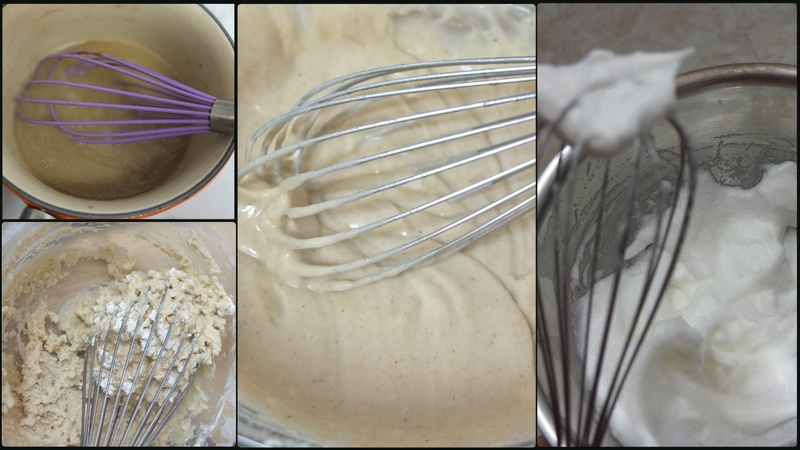 You can make them with my adaptations or according to the original recipe with full-fat or semi-skimmed milk, plain all-purpose flour and standard sugar or pure maple syrup. They have quite a lot of butter (even when reduced) so you could probably use less or perhaps vegan butter. Add other flavours as you prefer but I found the chestnut spread or purée really made these waffles special and balanced out the butteriness. No need to serve with butter or cream! I enjoyed them plain or with ham and cheese. Or a little cranberry sauce mixed with some natural greek yoghurt like in this earlier prototype. Noisette means ‘hazelnut’ by the way, because of the butter’s nutty flavour. Beurre noisette (commonly used in financiers and madeleines) can include the foam that has gone quite dark or be milder. 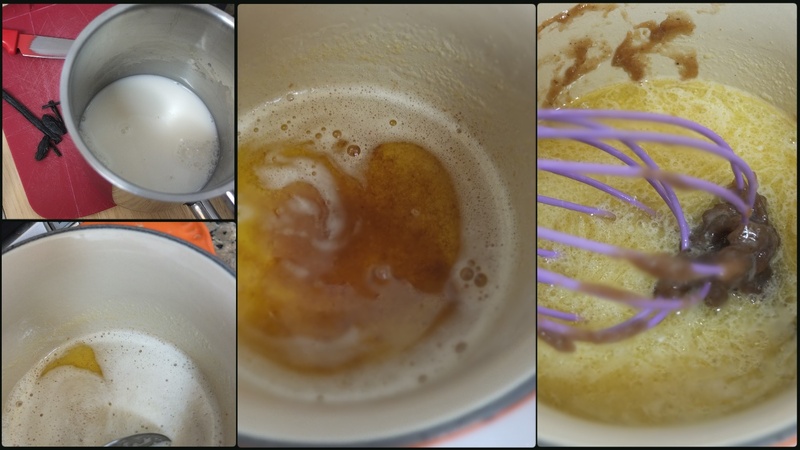 You can see videos on youtube about various methods to get beurre noisette in 5 minutes. Mine could have been browner. 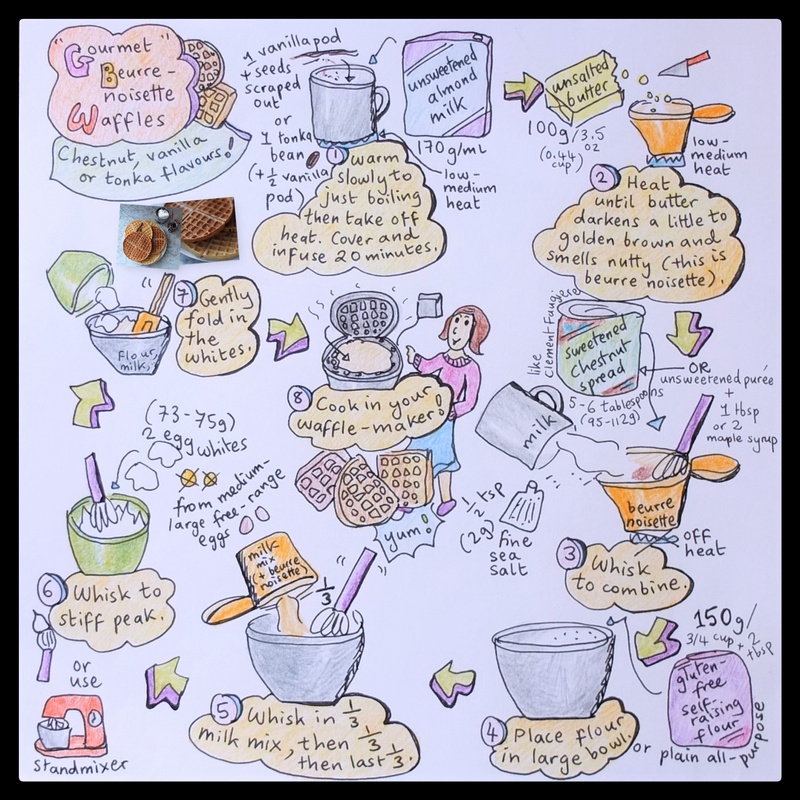 I liked this youtube video on making beurre noisette. He also makes an interesting comment on the illegality of burnt butter! Lol. Or watch this video. The waffles that were cooked longer were a bit crisper and tasted more caramelised – very tasty. Lighter ones are good to freeze because they’ll go in the toaster to refresh and will darken then. 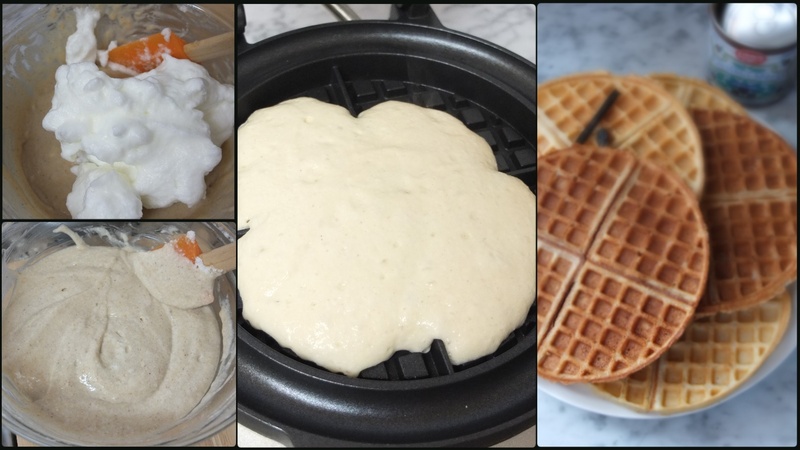 The darker waffles in the photos are the chestnut ones, my favourites. The lighter ones have just vanilla, tonka bean and a little maple syrup. Eat immediately while warm and crispy. 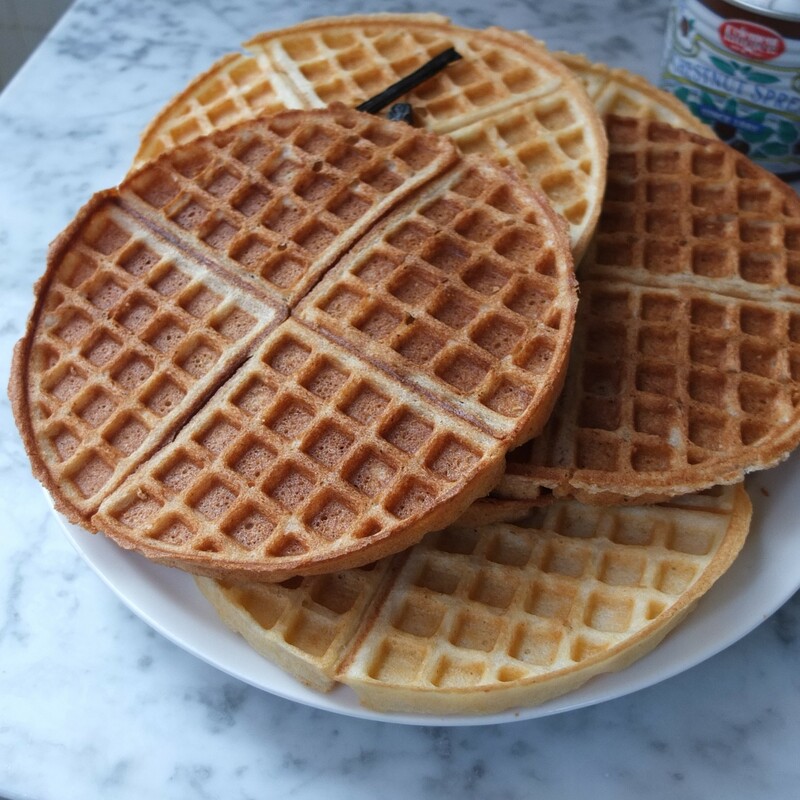 Or wait if you like soft waffles. To make them crispy again just pop in the toaster or oven. To store in the freezer wap bundles of 2 or 3 tightly in plastic film then to eat bring out and pop directly in the toaster (or oven). Eat alone, with cranberry sauce or a citrus jam that isn’t too sweet. Ooh… must try them with marmalade. 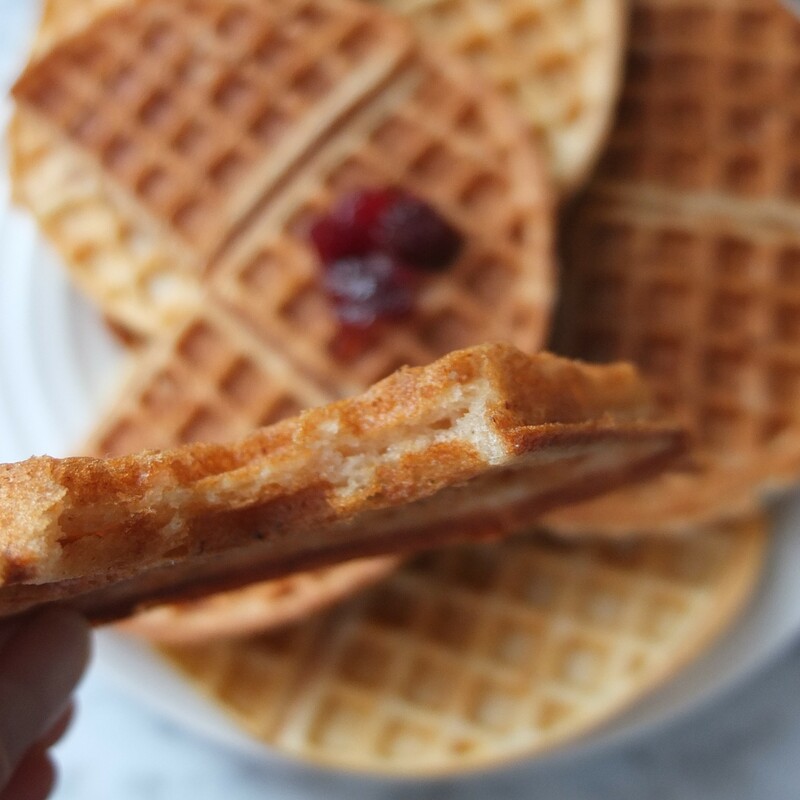 Hope you’ll try some chestnut beurre noisette waffles! They’re so delicious! Wow ! 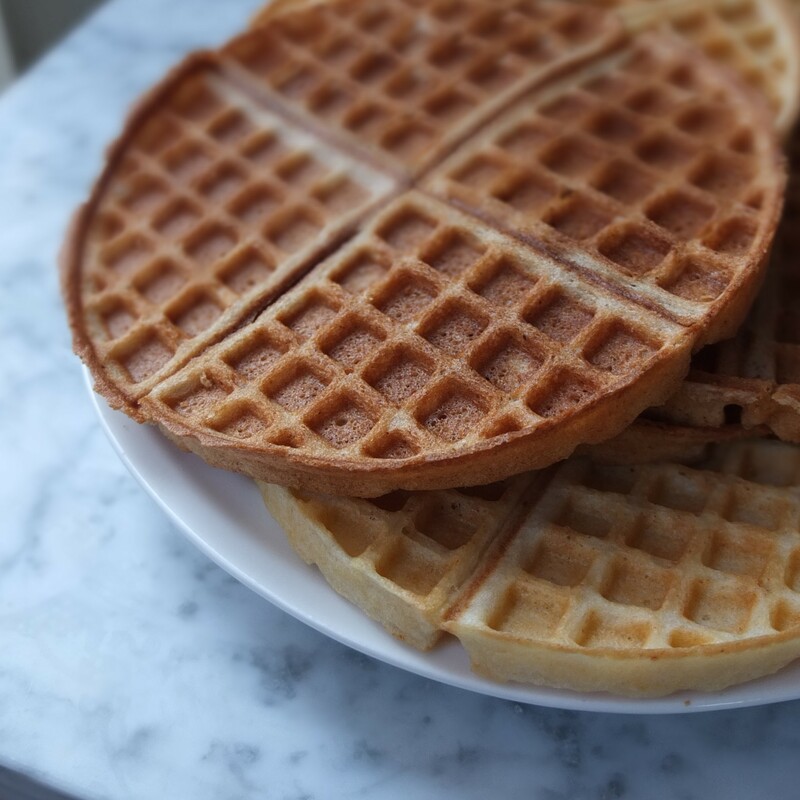 Love these perfectly baked waffles !! To sad that I do not have a waffle maker!The waffles look amazing!